Options Strangle - What Does It Mean? 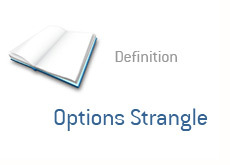 What is the definition of a "strangle" as it pertains to stock options? "Strangles" are useful when you believe that there is going to be a big move in the direction of a stock, but you aren't quite sure which direction it is going to be. For instance - XYZ Pharmaceuticals is hoping to receive final approval for one of their major drugs from the FDA. An approval would means billions of dollars for the company, while a rejection would be crushing. You know that there is going to be a major move in one direction, but you aren't quite sure which direction it is going to be. With the strangle, you are looking to purchase out-of-the-money calls and puts on the same stock, and with the same expiry date. For instance - XYZ is currently trading at $20 per share. October 10 puts are currently trading at 45 cents per share, while October 30 calls are currently trading at 45 cents per share as well. In order to initiate a strangle on XYZ, you would purchase (just as one example) the October 10 puts as well as the October 30 calls. Both are well out of the money right now. You are hoping that XYZ makes a massive move in either direction. For instance, let's say that the FDA rejects the drug, and XYZ plummets to $8 per share. This would mean that the October 10 puts would be worth much, much more, while the calls would be pretty much worthless. You are hoping that the profits in one side of the trade more than offset the costs of the other side of the trade. If you ended up selling the puts at $3.50 for instance, and the calls expired worthless, then you would end up banking a hefty profit on the trade. The movement in the puts allowed you to bank a profit, even while the calls expired worthless. 1. Implied volatility. You need to be careful, because a stock that is expected to be handed a major decision from the FDA is going to have a great deal of IV built into the price of the options. 2. If the stock doesn't move as expected, then both sides of the trade will likely become worthless. What happens if the FDA delays its decision on XYZ's new drug? You could be left with two worthless options positions. This is the biggest risk when it comes to strangle positions - the disappearance of the "catalyst" that is supposed to be having a big impact on the stock. Or, in other cases, the "catalyst" not having the impact that you originally anticipated. Strangles are high risk positions. When you hit, you will hit big, but you will very often lose as well.